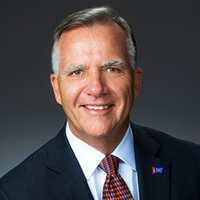 Since becoming CEO of the American Cancer Society in 2015, Gary Reedy has made research the organization's top mission investment, committing to double its annual research funding by 2021. For over a century, the American Cancer Society has dedicated its mission to saving lives from cancer. Since 1946, the American Cancer Society has invested more than $4.5 billion in cancer research. Many of those investigators who received funding, including 16 in the last decade from Winship, were young scientists just starting out in their careers. In fact, Winship principal investigators received more than $5 million in direct awards or subcontracts since 2009. Since becoming the Society's CEO in 2015, Gary Reedy has made research the organization's top mission investment, committing to double its annual research funding by 2021. A commitment to funding researchers who are fresh to the laboratory holds a key place in that investment. "We are proud to support researchers early in their careers at Winship Cancer Institute and at other institutions around the country," says Reedy. "So many of the scientists we've funded have made discoveries that have changed the way we view and treat cancer today." Reedy, who had a 37-year career as a health care business and advocacy leader, started volunteering with the American Cancer Society 17 years ago. During that time, he served as chair of the Society's volunteer Board of Directors and the American Cancer Society Cancer Action Network Board.